Preheat the oven to 400°. Slice the tomatoes in half. Toss with the olive oil and a pinch of salt and pepper. Spread in a single layer on a baking sheet, cut side up. Roast the tomatoes for 15-20 minutes. Cook bacon in a 10-inch skillet over medium heat until crisp. Transfer to paper towels to drain, reserving fat in skillet. Whisk together 1/2 tablespoon hot bacon fat, sour cream, milk, vinegar, and 1/8 teaspoon each of salt and pepper until smooth. Stir in scallion and 1/3 cup blue cheese. Thin with additional milk if desired. Light a grill or heat a grill pan over medium heat. Cut the washed heads of romaine straight down the middle, starting at the stem end. Brush the grill or grill pan with a good coating of olive oil. Place the cut halves of romaine, cut side down, onto the grill and grill for 1-2 minutes, until char marks have appeared but the lettuce isn't terribly wilted. 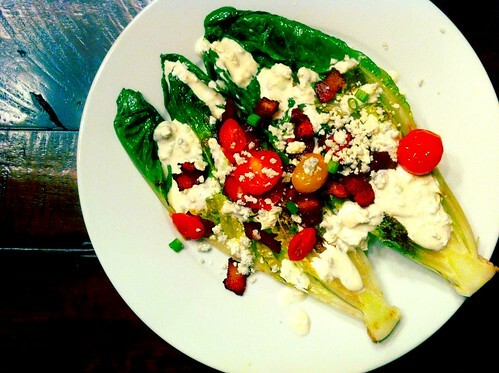 Transfer the lettuce to plates to serve, dividing the roasted tomatoes, bacon, dressing, and additional crumbled blue cheese evenly over the top. Serve immediately.